LEGO SERIOUS PLAY uses LEGO bricks and elements and a unique method where people are empowered to “think through their fingers” – unleashing insight, inspiration and imagination. In a very direct way, you will be able to see what everyone knows inside the company – and what they don’t know they know! Within a surprisingly short time, an organization can have a clear, shared direction with people who are confidently aligned and committed to a course of action. If you would build a LEGO time line of your processes, would they be mostly red and yellow? Or would they be mostly green? Besides the Build a Tester Workshop where I elaborated on how LEGO mini figures could facilitate a discussion on both tester types and team skills. 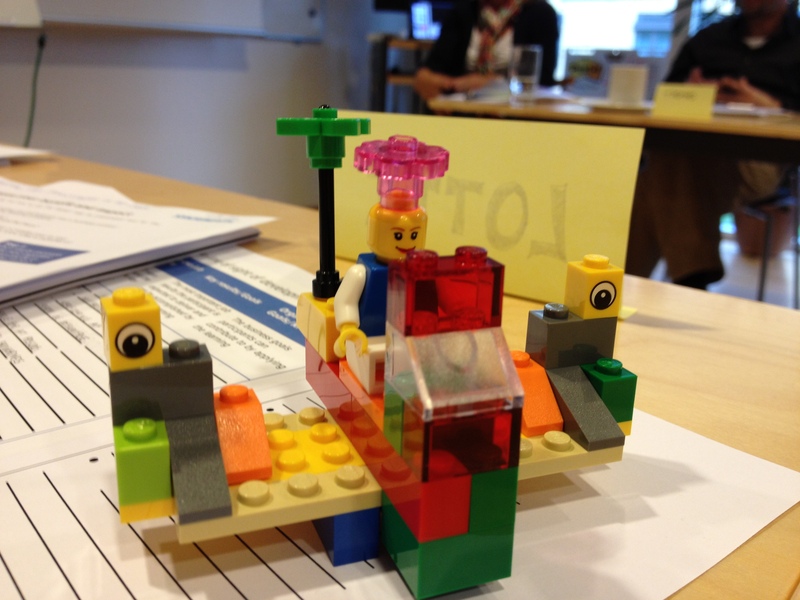 Recently I have had the personal opportunity to participate in a facilitation training, where LEGO bricks and figs was used to illustrate team members, represent user personas and user innovations. So the thing is – what do you need to get started? Choose your pieces by context: Customised Minifigures, city people or a huge pile of bricks? You need to get people into a storytelling mode and thinking in metaphors. So I start by just a few basic techniques to get them to play and build. Then when they are telling and thinking in fantasy models and metaphors, I pose just one or two questions. Not how everything was in the last sprint but more, for example, how everyone perceived communication or collaboration. So I pose some bigger questions. The results are very insightful. Every team member has something to say and it is also easily shared. Lego Serious Play combined with Scrum or Kanban meetings also has one other big advantage. People remember. You have to know that when people use their hands while talking, new neurological connections are made in the brain. What is said is, so to speak, fixed visually in the mind.